Door County Folk Festival founder Gerhard Bernhard (left) and co-director Paul Collins in Sister Bay at the 2010 Folk Festival. Submitted. “If you can walk, you can dance. It’s as simple as that,” said Gerhard Bernhard, founder of the Door County Folk Festival. 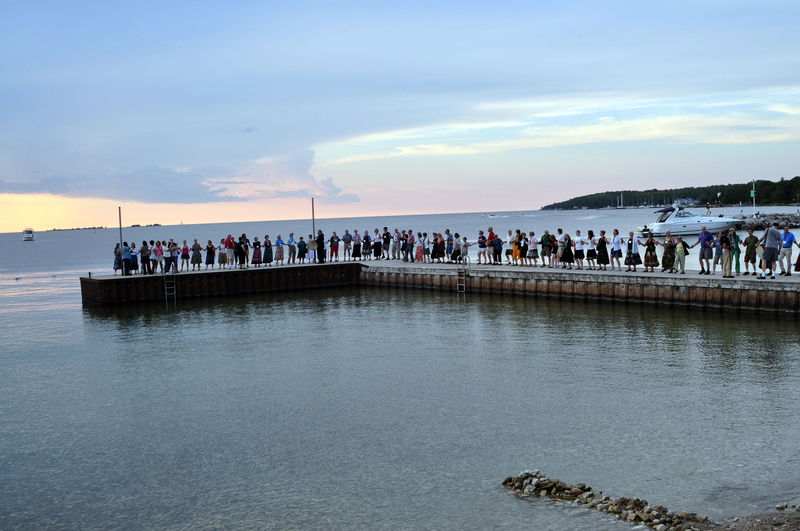 From July 12-16, hundreds of visitors will come to Door County to celebrate that same spirit. The folk festival, entering its 38th season, was an effort to foster the arts community in Door County. “I thought, how can I make a contribution here?” Bernhard said. Bernhard’s sentiment was alive and well in Door County. Just a few years before Bernhard made his way here, a friend of his from Chicago had started a performing arts center in a barn; and even more friends of his were putting together a midsummer classical music festival the same time the folk festival was getting its sea legs. 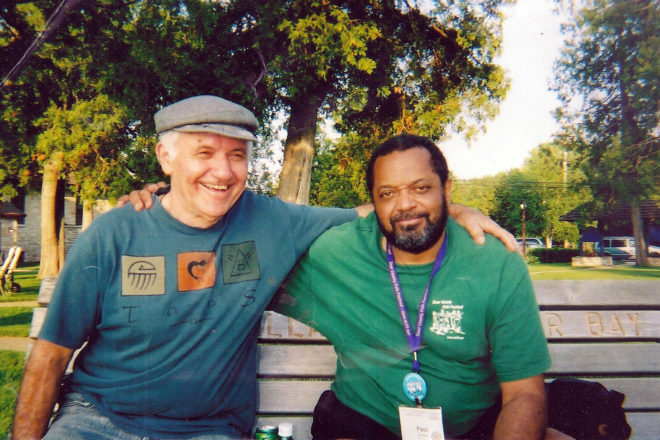 The seed of the folk festival was planted 10 years before it started, with the meeting of Bernhard and his future co-director, Paul Collins at a party in Chicago. At the time, Bernhard was a member of American Youth Hostels (AYH), which had a folk dancing group. Collins, who ran a folk dance festival at the University of Chicago, became quick friends with Bernhard. The two would go to folk dance events several times a week for the next decade. Sick of the profit-driven business life in Chicago, Bernhard decided to move to Door County and find a way to retire early. In 1980 he moved to Door County with plans to start a festival of Renaissance and Scandinavian music that would feature ethnic folk dancing as an “additional activity.” He advertised for the festival on his Sunset Concert Cruises, which he started running when the folk festival was in its second year. Bernhard would use the musicians he attracted to play the cruises at the festival, and vice versa. His timing couldn’t have been better. That same year, Collins stepped down from running the festival at the University of Chicago. So, Bernhard convinced his friend to come along and help start something new. The festival had a rocky start, however. Bernhard thought the large concentration of locals of Scandinavian descent would enjoy the festival. Two years in, Bernhard was in debt and at a loss. Collins had an idea on how to sort it out. Collins came on as a partner the next year and shifted the focus of the festival away from Renaissance and Scandinavian music and toward a participatory experience based exclusively on international folk dance. Attendees of the 2010 Door County Folk Festival dancing along the pier in Sister Bay. Submitted. The change in direction worked. Pretty soon people were coming up from the greater areas of Milwaukee, Madison and Chicago, and the festival was booking bands and musicians from Europe, including a 45-member group from Norway. The festival has enjoyed consistent attendance ever since, with regular attendance by people from more than 20 countries. Over the years, Collins and Bernhard recruited international dance instructors to complement their lineup of regional instructors. Collins also tapped into his experience as a contra dance caller to include it in the folk festival, eventually dedicating the entire weekend of the five-day festival to contra and square dancing. Workshops throughout the festival are geared toward education and accessibility. This year, with the folk festival teaming up with Door County Folk Alliance, a barn dance on Friday will emphasize getting people out to learn how to dance. The festival has existed as a celebration of community, of coming together through dance and culture. “Dance as a language in itself can provide a common bond in understanding other peoples and cultures,” Bernhard said. With workshops on Balkan traditions, Israeli dance, clogging, and many more, the festival combines traditions from many cultures, some of which have at times been joined through conflict rather than communion. “We wish everyone was dancing,” said Grace Bernhard, Gerhard’s wife. The two met at the festival, and loved to recount other love stories that took place at the festival. Door County Folk Festival takes place July 12-16. Fans of Contra dancing should arrive July 14-16 for Contra Dance Weekend. Lodging is available and can be arranged through the festival. For more information and to see the full festival schedule, visit dcff.net.